Historically, Aklan (formerly known as Minuro it Akean) is considered as the country’s oldest province and was believed to have been established around 1212-1213 by datus who were then fleeing from the island of Borneo. The arrival of these Bornean chieftains and the subsequent trade of land for a gold hat and jewelry with the Atis, (the local aborigines), was the start of the now world-famous Kalibo Ati-atihan which commemorates this exchange. Ati-atihan means to become like an Ati, and covering oneself in soot during the festival is to become an Ati all over again. Aklan dishes are not really known as a regional cuisine unlike its Ilonggo counterparts where Bacolod dishes can be easily rattled off as unique to them. Aklan as it faces the sibuyan sea is known for its fresh seafood harvested from the sea or the bangus and shrimps that are to be found in tanks where they are being propagated. Ask any Aklanon that no longer lives in the province and he will mention either the binacol or the inubaran as the dish he really pines for. Both dishes make one homesick and are usually the first thing they feel like eating when they ever get back home. Though it can be recreated wherever there is a homesick Aklanon it will not taste the same as eating it where it is familiar. Between the two, it is chicken binacol that is famous and is also claimed by other provinces. Though Ilonggos and people of Panay will say that it is strictly theirs, there are chefs and restaurateurs that have been featuring this mala-chicken tinola soup in their menus from Batangas, Davao, and Pampanga. This dish has graced many food festivals and is always featured as a main attraction when Ilonggo chefs are invited to showcase their food heritage. The chicken binacol although comforting and soothing is a dish more for the upscale settings and for special celebrations. It is jazzed up in its serving presentation as now it is most often served in a buko shell to remind the eater that buco juice is part of its essence. There is a big difference between what Aklanons call their binacol as against the stylized versions found outside their province. The presentation and its vessel is not authentic to the region. 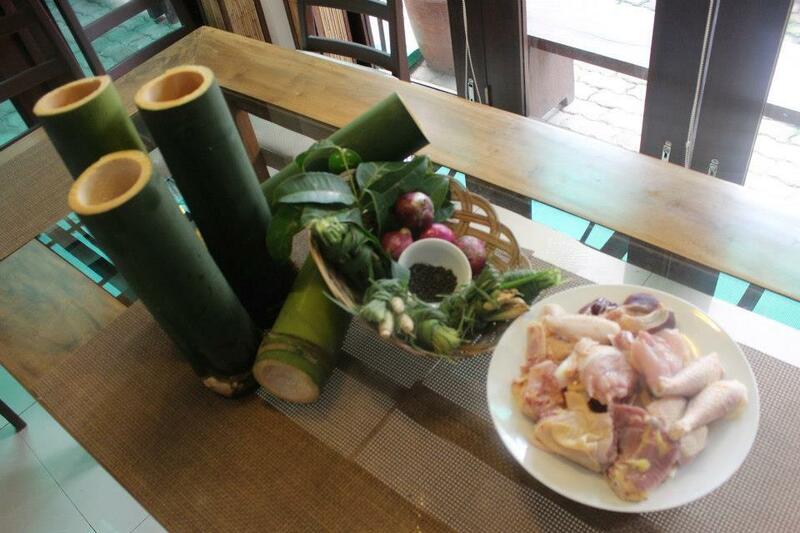 Binakol is a Kiniray-a term for cooking inside a bamboo tube and chicken is its main ingredient. Kiniray-a is a dialect spoken in Panay by the Antique and Capiz dwellers, so from the term itself, it was native to the region. 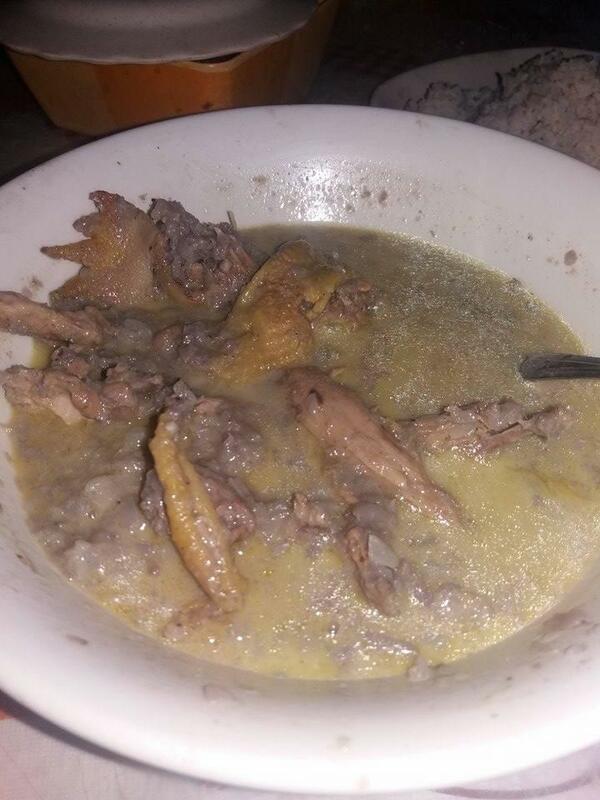 Basically, it is chicken and vegetables stewed in coconut juice. To easily explain what it is, non-foodies simply say that it is chicken tinola cooked inside a bamboo tube and with coconut juice. Chicken, ginger, and green papaya soup is a flavor profile that needs no lengthy explanation. Just say tinola and people know how it tastes. It is part of the Filipino’s simple and clean taste for a soup profile. For our chicken soup we want it to be flavorful yet light. A thin filling broth to warm us on cold days and to make us feel better when we are sick. However, to just simply say that binacol is similar is doing the binacol dish an injustice as it might be similar but they are also distinct from each other. In Aklan, not everyone prepares their own chicken binacol. But if you had a hankering for it and wanted one, you could not just call up a restaurant and have it delivered to your house. There are only a few good cooks who prepare it the old fashioned way, which is how you would want your binacol to be. For both dishes, binacol and the inubaran, there is planning involved to be able to get to eat this dish when you want to. If you wanted to eat them, you needed at a least a day in advance preparation. Both start with the native chicken called bisaya as both dishes only utilize them. Why, because it is abundant in the locality and has better flavor. Nothing can beat a native chicken for its tastiness, but to make it tender, you have to cook them over slow heat for hours to extract all juices and to make it moist. One thing that makes the binacol Aklan different is that theirs is cooked in a bamboo tube. This is the authentic real way of cooking a chicken binacol from the Aklanon mindset. The modern method of cooking would be to sauté ingredients, add the juice, and then have it simmer till chicken is tender. The old fashioned method would have all the ingredients mixed and dumped into the bamboo tube, then the coconut water is poured in, and the tube is topped with leaves, put over flames, and left to cook till done. Cooking time takes hours and, like in my kumare’s house where she does cook this the old fashioned way, it is prepared and cooked it in the morning, then the family eats lunch and plays mahjong while waiting for the binacol to finish cooking by dinner. And one thing with the binacol, as it is with the inubaran, is it makes one eat more rice than usual. You need more rice to better enjoy these dishes. Eating them alone without any rice or with bread just doesn’t seem right. You can automatically tell with a binacol recipe if it is an Aklan version or a Manila version. Sometimes, the Ilonggos also use rice washing water but if you ask an Aklanon about it, they will just scoff at you. Rice washing water is for tinola… not the binacol. It is the buco juice interaction together with it being cooked in a bamboo tube that gives it its unique aroma and sweet flavor. You see, unlike a tinola, the binacol is sweeter. As it also has buco strips and lemongrass, it has a more complex flavor profile than the chicken ginger soup. It is highly aromatic and yet as light and refreshing as a tinola. Just tastewise, it is richer because all its ingredients have influenced each other to come up with a familiar yet sweet, pungent chicken soup. Green papaya can be introduced as an ingredient but the key ingredients are native chicken, buco strips, lemongrass, buco juice, ginger, and patis. Sometimes sili leaves and ibas or in tagalog kamias are included. This is all that is needed together with the bamboo tube and the bed of coals on which to cook the binacol. Somehow chefs and cooks from other regions stylized the binacol to include potatoes and carrots, making it like a nilaga. This is not the Aklanon way. Back home in the province, they have elevated serving this dish. For fiestas, the bamboo tubes are paraded around first while still piping hot, before its leaf-toppings are removed, and then the tube’s contents are poured into a serving platter and waiters would scoop it into bowls for the guests. As the tubes are being opened, a wonderful smell would waft over the reception area. This forms part of the binacol eating experience as its aromatic scent makes eating it more enjoyable. While the chicken binacol is a special dish suitable for lunch after Sunday mass and for parties, the inubaran is the homey cousin who one can eat daily, and be filled and sustained. Utilizing ginger to take away the lansa of the chicken, this dish also uses coconut cream, and the ubad, banana pith. This is what home tastes like for a homesick Aklanon. While binacol can somehow be recreated wherever they may be, inubaran simply tastes different. Ubod in a can to be used in cooking this dish does not make what is being cooked as rich tasting and as crunchy-earthy as being in Aklan. The ubod in a can is from hearts of palm and not the centers of the banana trees. Here is a recipe for chicken inubaran in Aklanon. Being part Aklanon, it is so difficult for me to understand the language as I did not grow up there. I just enjoy having a recipe that is using the Aklan dialect as it is really funny for me to read it out loud. Gisahon ro bawang ag sibuyas. Idugang ro kiniwa nga manok, gisahon man. Idugang ro payok hasta mag bukae. Idugang ro tangead ag ro ubod it saging. Asinan ag idugang ro rikado. Kon amat hay ginadugangan man it aeabihig o kon owa hay eanggaw, depende sa panlasa. Ipabukae hasta maghomok ro manok. Funny but if I literally translate it as I think it means, the ipabukae means to open… so you have the chicken open till it gets homok or will be tasty and cooked. Even the payok which is kakang gata is being asked to open and release its flavor. The inubaran is similar also to a chicken tinola, you basically just sauté chicken in ginger and season it. It also utilizes coconut cream and the tanglad. What is distinctive is its use of the aeabihig or a souring agent which is a fruit or leaves that make your inubaran acidic. When I checked with my cousin she said it could be batuan. One thing I noticed when I am doing research on Aklan food is my mom’s food terms are no longer common to the younger ones. When I asked her about another name for leaves that are used as a souring agent, she says she has never heard of them, yet on the Internet, recipes abound using it from Aklan. Maybe their food terms are also generational. The ubad or banana pith is the center-most layer of the banana trunk. As a banana trunk is composed of layers and layers of ‘bark’ you have to peel each layer of the bark until you reach the white core or the whitish soft center. The centermost part is tender and sweet. This is sliced thinly across and added to the dish before the coconut cream is added. Inubaran is as different per household in its taste and texture as some cooks prefer a thinner stew while others want it thick. Also in terms of sourness and crunchiness, some want it slightly mushy and sour while others just want it crunchy but only a touch of acidity can be tasted. Some people cook the cream till it turns dark while others add luyang dilaw and make it look like curry. Another distinction is that Aklanons use atsuete oil also. So their gata always has a darker and different color instead of pale white that the Capiznons have. As I can not cook these chicken dishes, I just wait to receive care packages from back home. I distinctively remember my niece, who was about five years old that time, comment as I was reheating chicken inubaran to serve for lunch, “What is that? Some kind of lugaw? Why are the chickens so skinny and dark?” It was her first time to see the inubaran and she thought the floating bits were rice. Also, native chicken though soft would be dark in color. As we do not live in the province but in Manila, I try to recreate as much as possible and to have the younger generation know their food heritage. Somehow the eldest niece did not take to the lugaw but, boy oh boy, did she take to the binacol. I remember reheating the binacol the first time she ever got to taste it. I served it hot with a big platter of plain rice. Patis with sili and calamansi is our go-to sawsawan for binacol. Sacrilegious, I know as binacol is tasty and should never be tinkered with. I left the table as my sister and my two nieces—who were then only seven and five—were about to eat lunch, as I had to answer the phone. Lo and behold, when I came back, there was no rice left and only a chicken neck and a little puddle of binacol soup was left for me. And the two little girls had nice smiles on their faces and were not apologetic to have finished off the binacol. The binacol is part of their food memories and also evokes in them the warm fuzzy wish-I-were-eating-it feeling as both of them no longer live in the country. Food brings you back to moments in your life, which more often meant you were happier and more at peace. It reminds you of spending time with special people in your life and it also identifies you with a special group of people… could be a common culture or a special bond. The hard part of not being able to be in Aklan is the knowledge that the food will never taste as good as being there. As my mom says, try as she might, she cannot recreate inubaran when she is out of the province. The only just right inubaran she can create is the one that is in her mind, her memory of the best inubaran she eats while she is with her siblings at the dinner table. Sometimes, you can never compete with the memory of what is good.